The U.S. Supreme Court has determined the Second Amendment to the Constitution protects and guarantees our individual right to "keep and bear arms." And yet politicians at the national, state, and local levels continue to erect excessively high hurdles for the law-abiding citizens who want to own guns. Shall Not Be Infringed: The New Assaults on Your Second Amendment is a history of the gun-control debate in America and a revealing description of how those hostile to the Second Amendment use polls, studies, and numbers to confuse the public. Authors David Keene and Thomas Mason tell the story of the battle fought in the courts, Congress, state legislatures, the media, and even the United Nations to protect gun rights. The evening’s speaker, David Keene, is currently opinion editor of The Washington Times. 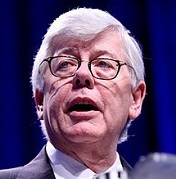 He served as president of the National Rifle Association (NRA) from 2011 to 2013 and was chairman of the American Conservative Union for more than 25 years before that, from 1984 to 2011. Wednesday, March 22, from 6:00 p.m. to 7:00 p.m.